If there’s one thing we know about Suicide Squad’s Joker from the crazy promotional photo and the Comic-Con teaser, it’s that Jared Leto’s version of the Clown Prince of Crime will be radically different from previous live-action iterations. Sure he may have the classic white skin, ruby lips and green hair, but the psychopath is also rocking some crazy tattoos and bejeweled teeth. Previous reports have listed that the DC Cinematic Universe’s Joker is partly inspired by The Dark Knight Returns, but a new photo suggests that Leto may also be pulling his interpretation from The Joker’s debut appearance in the New 52 relaunch. This past weekend, paparazzi (found via Comicbook.com) snapped a close-up photo of Leto’s phone while he was walking around, and the background is the cover of Detective Comics #1 (seen below), one of the many DC books that kicked off the New 52 in 2011. 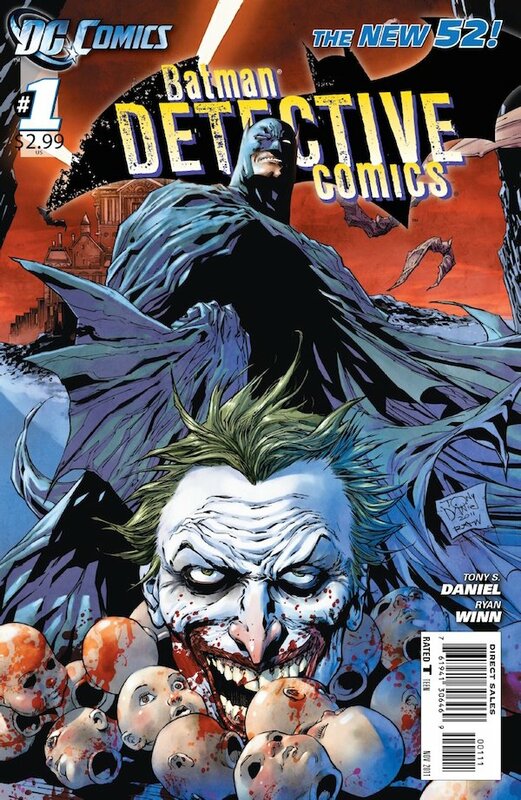 Detective Comics #1 is famous for delivering one of the most shocking moments in not just the New 52, but arguably in all of comic book history. After being captured by Batman, Joker had Baron Mathis, a.k.a. the current Dollmaker, cut off his face in Arkham Asylum at the end of the issue so he could be "reborn." If you decide to search for that particular panel online, be warned: it’s as grotesque as it sounds. This event served as the prologue to Scott Snyder and Greg Capullo’s Death of the Family storyline in the main Batman book. After disappearing for a year, Joker returned to Gotham City (wearing his cut face over his mangled visage) and targeted the members of the Bat Family to show Batman that they made him weak. After the Dark Knight defeated his arch-nemesis, Joker wasn’t seen again until the Endgame arc, where he decided to terminate his relationship with Batman by infecting Gotham City’s citizens with an airborne pathogen. As per usual, it was eventually defeated by Batman at personal cost. In terms of getting a grasp of Joker’s personality, Detective Comics #1 is a good basic primer, and speaking as a fan of recent Batman stories, hopefully Leto has already read/will eventually read Death of the Family and Endgame to see the full New 52 Joker story unfold. However, when it comes to the face cutting, that may be harder to pull off in a movie. Because Suicide Squad is exactly a year away from release starting tomorrow, we won’t know for a while whether it will be rated PG-13 like most superhero movies or if it will make the jump to R. If it’s the former, you can bet that will be too gory for the younger moviegoing audience, and if its the latter, it will still have to be done carefully. Little is known about how Joker will factor into Suicide Squad other than he will reportedly be incarcerated by Amanda Waller (Viola Davis) and there may be flashbacks of him torturing Harleen Quinzel, a.k.a. his future abused girlfriend, Harley Quinn. Still, if Joker does cut off his face in the 2016 blockbuster, you can bet that gruesome act will be followed up on in the future, whether it’s Suicide Squad 2 or the next Batman film. Jared Leto’s Joker can be seen alongside the rest of Suicide Squad’s diverse cast when the film hits theaters on August 5, 2016.